For general inquiries, please email Matthew, the Web Rat. We are currently only accepting new memberships for Laser sailors. Contact Ed the Key Rat about joining. For other questions, please email a board member below. The club doesn't have staff or a phone number. We're too busy messing about in our boats, enjoying the water and being social. Learning to sail? While we have sailing mentorship nights you may be interested in formal classes with our friends who are also in the Outer Harbour Sailing Federation. These include the OHSF Youth Water Sports Camp, J-Town, Mooredale, Westwood. Also see Sailing Fanatics. Note, we don't rent boats or host corporate events. 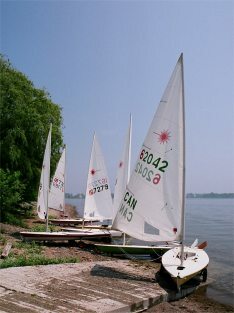 4 Regatta Rd is beside Cherry Beach Clarke Beach Park. See our directions. As a not-for-profit club, we have a responsibility for the stewardship of the land and water we enjoy. For thousands of years Toronto's lake shore and nearby rivers have been the traditional land and passageways for the Huron-Wendat, the Seneca, and most recently, the Mississaugas of the Credit River. Today, after more than a century of newcomers, Toronto is still the home to many Indigenous people and we are grateful to have the opportunity to enjoy these waterways and land.